Distribution: Rocky shores and reefs. Description: The textile cone shell, sometimes simply known as "cones", (family Conidae), belongs to the taxonomic family of medium-sized to large, sophisticated predatory marine gastropod molluscs. The shell is shaped roughly like an ice-cream cone. The narrow end of the cone shell is the anterior end, and the wide end shows the usually very low spire of the gastropod shell. The larger species can grow up to 23 cm in length. Habitat: There are about 500 different species of cone shells world wide and several of the most venomous live in Australia. Whilst typically found in warm and tropical seas some species are adapted to temperate environments. At rocky shores and temperate reefs they hide and hunt under rocks in the lower intertidal and shallow subtidal zones. Ecology: The textile cone are carnivorous, and predatory. They hunt and eat prey such as marine worms, small fish, and other molluscs, The prey is immobilized using a modified radular tooth along with a poison gland containing neurotoxins; launched out of its mouth in a harpoon-like action. The textile cone should not be handled as it is capable of injecting venom into humans with the possibility it could be fatal. 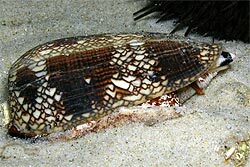 About 15 deaths can be confidently attributed to cone shell invenomation. There is no antivenom, and treatment involves providing life support until the venom is metabolised by the victim. The venom of cones contains hundreds of different compounds, and its exact composition varies widely from one species of cone shell to another. The toxins are called conotoxins. Interesting facts: The venom of some cone shells, such as the Magician cone, Conus magus, shows much promise for providing a non-addictive pain reliever 1000 times as powerful as, and possibly a replacement for, morphine. Many peptides produced by the cone shells show prospects for being potent pharmaceuticals, such as AVC1, isolated from the Australian species, the Queen Victoria cone, Conus victoriae. This has proved very effective in treating post-surgical and neuropathic pain, even accelerating recovery from nerve injury. The first painkiller Ziconotide derived from cone toxins was approved by the U.S. Food and Drug Administration in December 2004 under the name "Prialt". Other drugs are in clinical and preclinical trials, such as compounds of the toxin that may be used in the treatment of Alzheimer's disease, Parkinson's disease, and epilepsy. 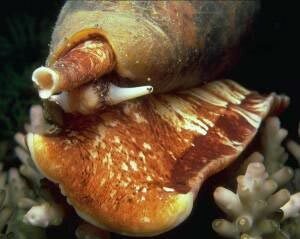 Status: Like all Gastropod molluscs ocean acidification is the key threatening process for these invertebrates.